Bitumen products offered by Bitum Logistic Sp. z. o. o. come exclusively from reputable producers from central and eastern areas of the European Union and the CIS. Products supplied by Bitum Logistic Sp. z o.o. meet the requirements of the European Standard, including but not limited to PN-EN 12591, PN-EN 14023, PN-EN 13808, PN-EN 13304, have certificates of quality, the CE marking and are registered in the REACH system. EKOTERM PLUS light heating oil is the highest quality product, compliant with the world standards both in terms of operational parameters and environmental protection requirements. EKOTERM PLUS is an ideal fuel for central heating boilers in houses, hospitals, schools, etc. In the Polish climatic conditions it is important to ensure the continuity of the boiler operation, especially in the winter season. To meet these needs, we guarantee the certainty and timeliness of deliveries, as well as the quality of the product sold. Since August 2015, we have been able to perform piles in the CFA technology as well as displacement piles and columns in the TurboJet and DSM technology with the SOILMEC SR-45 piling machine. Bitum Logistic is engaged in the transport of bitumens, fuels and chemicals in tanks. We have many years of experience in the sector of transport services within the area of Poland and the European Union. The main directions where we transport road bitumens include: Poland, Hungary, the Czech Republic, Slovakia, Romania, whereas chemicals are transported to the Western European countries (Germany, France, Spain, Italy). Appropriately qualified personnel of our company as well as the reliable equipment we have guarantee timeliness of deliveries and customer satisfaction resulting from cooperating with us. We have a modern fleet based on the MAN and Kassbohrer equipment. Tractor units with Euro4 , Euro5 and Euro6 engines, semi-trailers with the latest technical and operational parameters with the capacity of 32000L. All our vehicles are equipped with a monitoring and location system using the GPS satellite technology and we are in constant contact with the drivers, which allows us to eliminate delays in the delivery of our services. We have a team of qualified technicians dealing with complex repairs of asphalt mixing plants. Our offer includes locksmith and welding as well as mechanical services. Bitum Logistic Sp. z o. o. has experienced staff of construction workers who deal with the overall installation of acoustic barriers throughout the country. - Making reinforced concrete piles in the CFA technology with a diameter of 400 mm to 800 mm, with a drilled pile depth of 7.5 meters. - Making heads of acoustic barrier pillars. - Installation of feathered and anchored piles, among others, on bridges and viaducts. - Installation of fillings and foundations. 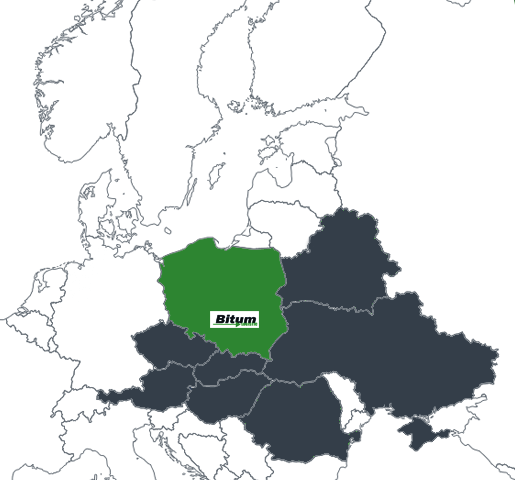 Bitum Logistic is a provider of petroleum products, in particular bitumens from renowned manufacturers from the area of Poland, Hungary, the Czech Republic, Germany and Belarus. Medium- and large-size drillings with the use of the CFA method are another service offered by the company in addition to the repairs of asphalt mixing plants. Bitum Logistic was established in 2003, initially as a company providing transport services to Piast Sp. z o.o. [Ltd.]. With time, Bitum Logistic broadened its activity by expanding its offer with commercial and construction activity, providing services to road building companies. Despite the great advances made in the country when it comes to infrastructure investments, there is still much to do to achieve the European level, both in terms of new investments and the revitalisation of road pavings. The period of at least up to the turn of the 2020s and 2030s should bring new road and rail routes. Meet people with passion, who provide professional service and competent knowledge. Our team of experts mean over 10 years of experience – more than 100 projects, hundreds of satisfied customers and contractors. Our business partners are mainly SME (small and medium enterprises). We provide services for transportation leaders and cooperate with retail customers with regard to Ekoterm supplies. Bitum Logistic Sp. z o.o.